The signing of The Lateran Treaty established Vatican City as an independent state in 1929. With little more than 400 citizens including Swiss guards, Cardinals and His Eminence the Pope, the state of Vatican City is the smallest independent state in the world. It is also the site of the Holy See (from the Latin sedes meaning seat) presided over by its bishop, the Pope. As the head of the Catholic Church, the Pope is subject to no government or political power. The Holy See enjoys diplomatic relations with 123 countries. The United Nations declared the Vatican a World Heritage site for its cultural importance. The reigning Pope usually lives in apartments in the Palace of Sixtus V referred to as the Vatican Palace or Apostolic Palace. The Vatican treasures are abundant. Art and architecture both ancient and modern in form and context have been commissioned over time to beautify and glorify the Vatican and St. Peter's Basilica, the spiritual heart of the Vatican. Emperor Constantine is said to have built the original Basilica on the Vatican hill over the burial place of St. Peter. Popes and cardinals have been the patrons of artists and architects through the ages. Some works of art reflect the history of the popes, such as Giorgio Vasari’s 16th century painting, "Pope Gregory XI returns the papal seat from Avignon to Rome". Prior to this the popes resided in France. Julius II was Pope from 1503 to1513 and was a committed patron of the Arts. Whether his intentions were a display of power and grandeur or whether it was for love of the arts has spurred much controversy. 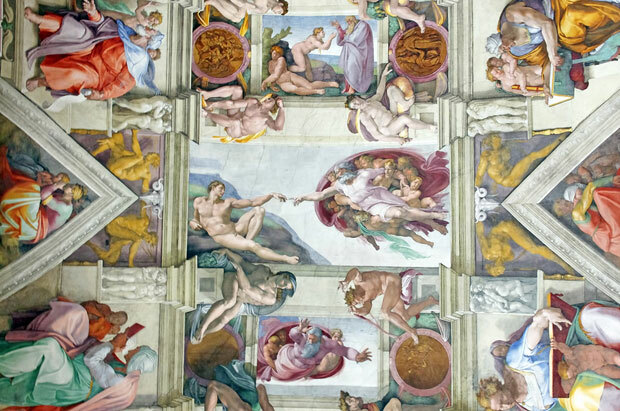 From his friendship with Michelangelo in 1506 came the commission for the painting of the ceiling of the Sistine Chapel unveiled in 1512 and which has become one of Michelangelo’s most admired works. 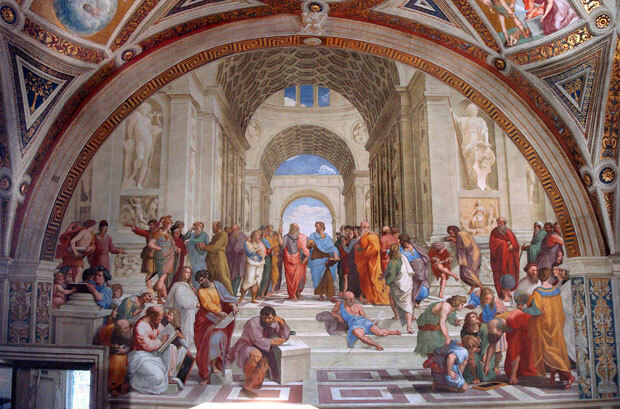 In 1509 Julius II was introduced to Raphael whose painted frescoes adorn the three rooms of the Stanza della Segnatura now known as the Raphael Rooms. He also commissioned Donato Bramante to design the new basilica when the restoration of St. Peter's was undertaken, the completion of which only happened under the reign of Paul V, 1605 to 1621. After Bramante’s death, Raphael drew up new plans and Michelangelo worked on the magnificent dome which was nearly complete before he died in 1564. Gian Lorenzo Bernini, a leading sculptor, artist and architect in the 1600s, was a successor of Michelangelo and it is said that his work was the beginning of the Baroque period in sculpture. He was supported in his artistic journey by both Pope Urban VIII and Pope Alexander VII and was knighted by Pope Gregory in 1921. 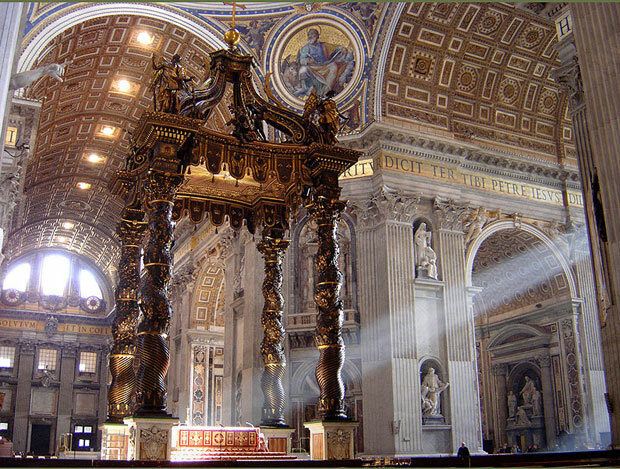 In 1624 Pope Urban VIII commissioned Bernini to create the baldacchino over the high altar in St. Peter's. It had to portray "heavenly lightness", which was extraordinary considering that all the brass to be found was used to complete it. He designed the Piazza San Pietro, the square in front of St. Peter's including the massive Tuscan colonnades which curve around the piazza and which he described as "the maternal arms of mother church". At the centre of the Piazza is the red granite Egyptian Obelisk, relocated by engineer Domenico Fontana under the patronage of Pope Sixtus in 1586. It is said that it took nearly a thousand men, 140 horses and 47 cranes to move and position it. Bernini’s fountain in St. Peter’s square was built under the patronage of Alexander VII as was the creation of an exquisitely sculpted gilt bronze to enclose the cathedra petri or throne of St. Peter (originally a wooden seat that was used by the popes). It was the last of the great works in the church made by Bernini. Pope Nicholas V established the original library in 1448, and in the late 1500s when Pope Sixtus reigned, Domenico Fontana was commissioned to build a new one. Today this building holds over a million books and at least 75,000 manuscripts. The Secret Archives are not secret in the sense of being hidden, they are available to certain scholars and researchers who may apply to access the archives. They contain miles of shelving on which are volumes of papers and documents. All are the property of the reigning Pope of the day until he is succeeded. The contents of the volumes pertain to all acts undertaken by the Holy See, whether it be a request from a Royal for annulment of a marriage or relations with heads of state. Pope Leo XIII opened the archives in the early 1800s. 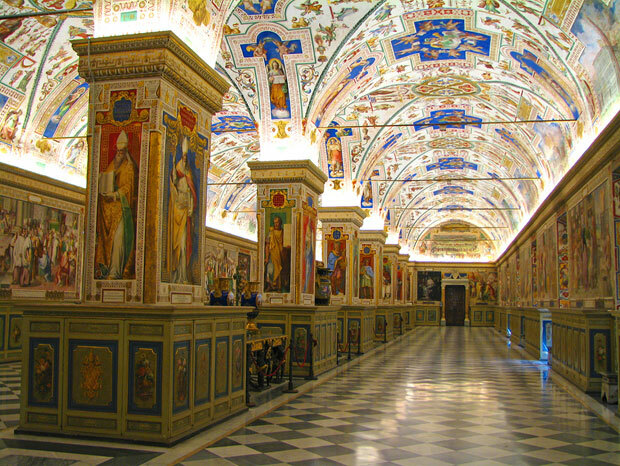 The Vatican Museums and galleries contain the works of the greatest artists, including Leonardo, Titian, Caravaggio, Giotto and many others. The Museo Gregoriano Etrusco established by Pope Gregory XVI has a collection of archaeological findings whereas the Museo Gregoriano Egiziano has an ancient Egyptian collection. The Museo Chiaramonti, a combination of the collections of Pope Pius VII and Pope Clementine VIII, has a new wing, Braccio Nuovo. Within the Chiaramonti is the Galleria Lapidaria housing over 3,000 stone tablets and inscriptions, the largest collection in the world. The Borgia apartments frescoed by Pinturicchio under Pope Alexander VI’s reign are also considered part of the Museums. "Art is like an open doorway to the infinite"
The domain of the popes is a magnificent collection of art and artefacts in a spectacular environment of elaborate and wondrous architecture, most of which is accessible to be viewed by millions from around the world. This has to validate the existence of such a wealth of artistic treasures owned by the church. Pope Benedict XVI who preceded the current Pope, Francis, was a patron of the arts and his words, "art is like an open doorway to the infinite", lead us to think about how much art reflects a social conscience and in its beauty, and often in its sacredness, takes us to a more conscious level. The new Pope, Francis, was sworn in to the papacy this year, his prime focus being to alleviate poverty. We can only wait and see in what way he will add to the Arts and Treasures of the Vatican and Italy, for without art we are indeed impoverished.